TV prices set to rise? After years of growth, the major manufacturers' over-optimistic predictions for worldwide demand have left a glut of plasma and LCD TVs gathering dust in warehouses. It was thought that major sports events like Euro 2008 and the Olympics would mean huge demand for flat panel TVs over the summer, but the stagnant economy across the world ruled that out. With consumers and corporations cautious, instead we've seen prices falling across the board by as much as a fifth as shops try to clear a backlog of TVs and monitors. While that sounds like good news for buyers, market analyst iSuppli is now predicting that September will see prices rise. "The large-sized LCD panel market has been mired in a state of severe oversupply since the start of June, due to lower-than-expected panel demand and high inventory levels throughout the supply chain," said Sweta Dash, director of LCD and projection research at iSuppli. "Conditions have worsened in August, with poor economic circumstances causing prices to decline at an even faster pace than before. However, panel production cuts, combined with the clearance of inventory and a recovery in demand from televisions, desktop PC monitors and notebook PCs are expected to shift the supply/demand equation back to balance in September. This will lead to a recovery in pricing." iSuppli reports that prices of flat panel TVs, monitors and laptops dropped by four to seven percent during May and June, three to 15 per cent in July, and as much as 20 per cent through August. "LCD TV and desktop PC monitor manufacturers also are starting to cut their prices in order to reduce inventories and boost end-user demand," said Dash, who predicts that the market is about to stabilise. "Some panel prices may even increase by one to three per cent, especially those which are reaching at or below the cost levels." Dash blames falling housing prices, struggling financial markets, a slowdown in the job market and rising inflation worldwide for the situation. China was expected to be a major market for flat panel TVs this year given its hosting of the Olympics in Beijing and general rise in wealth, but natural disasters - such as the earthquake in Sichuan - have reduced demand, reports iSuppli. 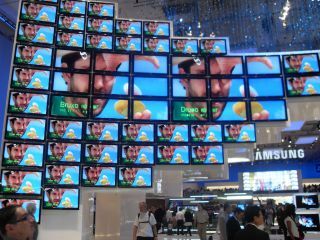 The UK market for flat panel TVs is one of the most aggressive in the world and in recent months prices have been slashed. "The number of TVs sold is larger than in last year although it's not as much as our original anticipation," said Toshiyuki Tajima, CEO of Sharp Electronics Europe, one of the world's biggest suppliers of LCD panels. Speaking to TechRadar at Berlin's IFA show, Tajima-san said: "Fortunately at a company level in Europe we don't really have the overstock situation in our warehouses. However, distributors might have an overstock, but that depends on the country and the company. We are carefully watching the prices rather than initiating them." Andrew Griffiths, Vice President of Samsung's Consumer Electronics Division, thinks that prices of LCD TVs will keep on going down. "The interesting issue in the market at the moment is the retail price war that's going on," he said. "Retailers are very aggressively fighting each other for their share and that's presenting some very good bargains for consumers - and we see that continuing through this coming peak season." Griffiths also told us that as the economy bites, TV manufacturers will have to try even harder to tempt consumers: "We have to be careful in our planning and be even more focused on bringing the right products to market, exciting consumers to spend whatever spare cash they do have in our direction." Judging by the wares on show at IFA by the big brand - such as 100Hz (and even 200Hz) technology, slimmer designs and network connectivity - consumers could be about to get more for their money.